From the junction of Highways 3 & 10 (just south of Boissevain, Manitoba) go 4 miles/6 kms. west to Lake Max Road, then 3 1/2 miles/5 kms. south (into the hills) to the Room To Grow sign. Out of Winnipeg the # 2 highway is the fastest – 2 ½ hours – but Highways 1, 3 and 23 and their side roads all (a bit longer in time and distance) have more enjoyable scenery. From the west on # 3 Highway, look for the Lake Max sign about 15 miles/25 kms east of Deloraine. Turn south there (gravel road) and travel up into the hills for 3 ½ miles/5 kms until you see our Room To Grow sign. From the south through the USA – Canada border at the International Peace Garden, travel north on # 10 Highway for 7.2 miles/11.5 kms and look for a small sign for McKinney Road. Turn left/west and take this gravel road for 4 miles/6 kms until you come to a stop sign. Turn north/right here and drive 1.5 miles/2.5 kms until you see the Room To Grow sign. 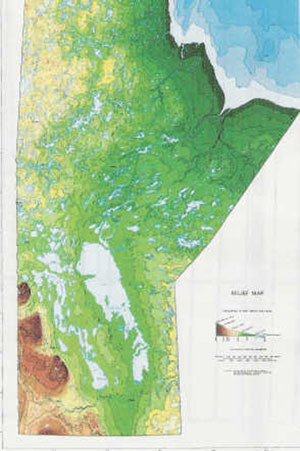 The cross cut and relief map to the right give some perspective on the altitude and therefore also the ecosystem changes you’ll encounter as you approach the Turtle Mountains (dark brown area in the southwest corner of the relief map). Welcome to a journey from the urban, highly managed flat lands, through the Pembina Hills with its mixed farmland and river valleys, to the forested ‘highland’ of the Turtle Mountains and into the quiet clearing of our yard. (Most of our guests come from Winnipeg, so this information is put together in particular with them in mind.) We’re keen to brighten and deepen your travel experience from there to here – if you care to hear us out. If you don’t – no worries. Enjoy the road. It takes 2 1/2 to 3 hours to get from Winnipeg to our place – depending on how many breaks you take – and if you take one of the more direct routes featured below. #2 is the fastest. It can be done in 2 ½ hrs from the perimeter to our place with no-nonsense driving. #23 and #1 are about ½ hr longer. # 3 is a bit longer still. # 1 Hwy is a continuation of Portage Ave and #’s 3/23 and 2 start at Oak Bluff (on the southwest corner of the perimeter). If you have the time and inclination we encourage you to find your own favorite combination of roads – using a map to fill in the blanks. The more creeks and rivers you cross the more scenic the drive. If you’re traveling late or very early in the day, you should fill your tank before leaving Wpg. Otherwise there are a number of gas station owners along the way who would enjoy your business. Rural gas prices are often a couple cents less than in the city. If you time your travel to include sundown, you are likely to be well entertained. The prairie sky is almost always a show. If you’re out at night keep a roaming eye on the northern horizon. We’ve been treated to many displays of Aurora Borealis (northern lights) while on these roads. Please excuse the repetition as the various routes use the same stretches of highway in places. Starting from the Perimeter/Headingly the #1 rolls along as a double highway. This route crosses the Assiniboine 5 times before you’re south of Brandon. The crossings provide some relief to the flatland prairie. When you’re in grain and potato growing country, you’ll notice the fields are huge and the homesteads a couple miles apart. There is a pretty stretch of highway between Portage la Prairie and Brandon; influenced, as its soils are, by sand from the ancient Assiniboine River delta. This river once emptied into the glacial Lake Agassiz in this area. Or you can go through Brandon by taking the #10 Highway South towards Boissevain and the Peace Gardens. Crossing the Assiniboine here for the last time before heading into the Souris and Pembina River systems, is the aesthetic highlight of Brandon. Brandon has a great little annual folk festival on the last Saturday and Sunday of July. The famous Lady of the Lake store, restaurant and bar/music spot is on the #10 on the left after the river crossing and before the railway bridge – worth a visit. The road south of Brandon is especially pretty at sunset because of the hills you encounter. On the way to Boissevain you cross the Souris River and its picturesque valley. Look out for the shadowy creatures in the bushes to the right of the road. My sister and brother-in-law have a cattle farm on the edge of this bit of paradise. The Souris River may seem like a puny prairie creek but we assure you it can be a majestic, wild-country experience taking inner tubes or canoes onto it. From this crossing the river flows east and north through a deep unspoiled valley. Depending on the season and the amount of rain we’ve had it can offer some beginner level rapids. If you choose to go through Boissevain you’ll find a scattering of fine outdoor murals on the sides of our larger buildings. There is also a wonderful First Peoples museum called the Moncur Gallery (after a local, self-taught archeologist) in the Library building. The liquor commission is in Hazelwood’s Pharmacy on South Railway Street. Beer is bought behind the Red Coat Inn right on # 10 Hwy. Groceries are found at the Co-op on South Railway Street. Gasoline can be found at the Co-op Station along # 10 (as modern as it gets around here) or from Gord’s Service on South Railway Street (if you prefer an old time, owner run gas station). Five k’s south of Boissevain (or 25 k’s west of Killarney), you’ll come to the corner of #3 and #10. Go west toward Deloraine from this intersection. (About 5 k’s along you’ll go past what used to be our family farm – where I grew up – on the left/south of the road.) 6 k’s along you’ll see a sign for Lake Max. Turn south along the gravel road and move up into the treed parkland. The snow or water you see in the creeks and wetlands eventually reaches Winnipeg via Cherry Creek, Pembina River and Red River. Just past the cultivated prairie (a bit more than 5 k’s from # 3 Hwy.) you’ll see our sign ‘Room To Grow’. Turn right. The Straw House is on your left when you’re on the yard. If you’re keen to get here as quickly and as straight-ahead as possible we recommend taking # 2 which turns right off of the # 3 just a kilometer or so west of Oak Bluff. Because you will be traveling north of the hilly(er) country the road curves less and goes through fewer valleys. Like most major highways on the prairies, this one parallels a railway line. Once you get to Elm Creek, you’re into more trees and mixed farming. This is still flat country but the soil is affected by the sandier conditions left over from the ancient Assiniboine river delta that emptied into Lake Agassiz just to the northwest. Past Elm Creek you come to St. Claud – a highly French influenced farming area. There’s a wonderful restaurant on the South side of the Hwy called Mama Lou’s – a cultural experience with great burgers. You climb out of the first prairie level, almost imperceptibly, between Rathwell and Treherne. (Treherne has one of the more popular roadside ice cream stops in summer.) You cross the slow meandering Cypress River that drains at Cypress River (the town) and then move up to Glenboro. If you’ve got time for a side trip, you can turn north/right here onto Hwy # 5 towards Spruce Woods Provincial Park and Forest. There is wonderful camping and hiking here due to the sand dunes left over from the above mentioned ancient river delta. The terrain turns quite flat around Glenboro. You can see the hilly country – that # 23 Hwy goes through – to the south most of the way along this road. (About 25 k’s past Glenboro you come to the # 18 Highway intersection. You can turn south/left here and go through Ninette and Killarney – see the #23 tour above) At Wawanesa you come upon the Souris River and it’s beautiful valley. You are traveling on the soil that was part of one of the most dramatic buffalo drops – a method First Nations people used to hunt bison by directing them over a cliff – on the prairies. The drop is just to the north of the highway towards the town. About 20 k’s past Wawanesa you come to # 10 Hwy. where you turn left/south. On the way to Boissevain you again cross the Souris River and it’s picturesque valley. My sister and brother-in-law have a cattle farm on the edge of this bit of paradise. The Souris River may seem like a puny prairie creek most of the time but we assure you it can be a majestic, wild-country experience taking inner tubes or canoes onto it. From this crossing the river flows east and north through a deep unspoiled valley. See reference to the Souris River Bend on this website. Depending on the season or the rains it can offer some beginner level rapids. In Boissevain you’ll find a scattering of fine outdoor murals on the sides of our larger buildings. There is also a wonderful First Peoples museum called the Moncur Gallery (after a local, self-taught archeologist) in the Library building. The liquor commission is in Hazelwood’s Pharmacy on South Railway Street. Beer is bought behind the Red Coat Inn right on # 10 Hwy. Groceries are found at the Co-op on South Railway Street. Gasoline can be found at the Co-op Station along # 10 (as modern as it gets around here) or from Gord’s Service on South Railway Street (if you prefer an old-time gas station experience). From Oak Bluff (which has a 24 hour Petrocan Gas Station), take # 3 Highway to Carman. The farms in this area have become large and therefore the farmyards are quite a distance from each other. You are driving on the bottom of what was Lake Agassiz thousands of years ago. Geographers refer to this area as the First Prairie Level because it is the lowest (in elevation) agricultural area on the Prairies. You’ll notice there are few native grassed or wooded areas and no wetlands. Farmers have been encouraged to drain the wet areas. Consequently you will not see many animals, domestic or wild, along this stretch. At Sanford you’ll come across the La Salle River, a welcome change to the scenery. This stream gathers water from as far as Portage la Prairie and deposits it into the Red River just south of Wpg. You might notice how the smaller towns differ in character. Some, like Sanford and Sperling a little farther along, just happen to be beside the highway. We don’t have to slow down for them and so we see little of them unless we deliberately turn in. Others like Brunkild require us to slow down and invite us to stop or at least check out what the place has to offer. Semi truck drivers and some commuters don’t like this inconvenience. They lobby the province to build bypasses around these small centres. Those of us who depend on services in our small towns, counter-lobby to keep the roads as they are, so as to attract visitors and their business. You’ll go past Homewood where my mother’s parents (The Klassens) farmed. Of the 15 children and 100 (or so) grand and great grandchildren born as a result of that union only 3 families are still farming in the area. Carman has been built up along the woodlands of the Boyne River. At the stop sign you can either: turn right to go to the business section, go straight to the beautiful Roseisle area or turn left to stay on the main tour route. The Roseisle option. When you’re at the stop sign in Carman, you might consider going straight and head towards Graysville / Roseisle on Provincial Road # 245. You’ll be traveling along the Boyne River system most of the way that makes for curving roads with more trees. About 15 k’s past Roseisle you’ll come to a stop sign. Take PR # 244 south along the top of the ‘escarpment’ which separates the first and second prairie levels. When you get to # 23 Highway, turn right/west towards Somerset, Swan Lake, etc. If you decided to turn left at Carman, you’re now traveling south on # 3 Highway – through farmland that sports a few more trees and farmsteads. There’s a large U-pick farm on the left along here. Stay alert for the railway crossing beside a solitary grain elevator. This is where you turn right onto #23 Highway – toward Miami. (If you choose to stay on # 3 you will eventually get to our place but it’s longer.) Take a look at the restored train station along the highway in Miami. Looking ahead you’ll see the poker straight road rise up to the second prairie level – essentially moving up out of the Agassiz lake bed into a mixed farming, parkland area. It’s a long slow, delicious climb with wetlands, ducks and cattle farms coming into view. Although there are large treeless areas here and there, for the most part native tree and shrub areas are accepted as part of the essential landscape. You’re now traveling along the highland between the Cypress and Pembina river systems. The farms are closer together and more numerous in this area. In contrast, though, with the flat lands around Winnipeg, you’ll see abandoned farms here and there. Back on the Lake Agassiz flats, any farm site that is abandoned is quickly flattened and incorporated into the surrounding fields. Land is worth so much more on flat land. It’s not allowed to remain unproductive for long. There is more hay land here which means more mice, gophers and rabbits. It also means more birds of prey like the red tail and the marsh hawk and the owls you may see sitting on large round bales and fence posts. Bald Eagles migrate through these hills in early Spring and late Fall, stopping for a few days when they find a carcass to feed on. A wonderful distraction along this route is seeing the 60 or so huge wind turbines generating electric power over the crop land around Somerset and St. Leon. At the junction of #23 and #34 you come to a stop sign. This is the beginning of the Swan Lake First Nation. (The lake is a few k’s to the south on the Pembina River.) Swan Lake is an Anishinabe community within Treaty #1. Their website is www.swanlakefirstnation.ca. Look up the dates for their big competition Pow Wow held each summer. This event brings in dancers and drummers from across the Great Plains and is open to the public. More mixed farm land and river valleys grace the road – and then you’re treated to a wonderful decent into the Pelican Lake valley and the town of Ninette. You’re now less than an hour from our place. When you get up out of the valley you’ll need to decide whether to keep going along #23 to the #10 and south through Boissevain or to turn left onto #18 and go through Killarney. Either of these towns offer decent food and refreshment shopping. If you go through Killarney you’ll need to get onto #3 Highway west at an intersection just South of the town. This is a cool road because you can see the Turtle Mountains (they’re mountains to us!) to the south and you’ll drive across and along a couple ravines that take water down from the hills to the Pembina river system. These ravines are a distinctive feature of this Highway. Most are fenced and provide native pasture and wildlife habitat. Keep your eyes open for beaver and muskrat huts, white tail deer and coyotes. If you choose to go through Boissevain just carry on #23 until you reach # 10 Hwy. Turn south/left at the stop sign. In Boissevain you’ll find a scattering of fine outdoor murals on the sides of our larger buildings. There is also a wonderful First Peoples museum called the Moncur Gallery (after a local, self-taught archeologist) in the Library building. The liquor commission is in Hazelwood’s Pharmacy on South Railway Street. Beer is bought behind the Red Coat Inn which is on # 10 Hwy. Groceries are found at the Co-op on South Railway Street. Gasoline can be found at the Co-op Station along # 10 (as modern as it gets around here) or from Gord’s Service on South Railway Street (if you prefer an old time, owner run gas station). This is probably the longest route and the only one that takes you from Oak Bluff right to our doorstep (well, five k’s from our door) without changing highways. Oak Bluff has a 24 hour Petrocan (southeast of the perimeter intersection). Take # 3 Highway to Carman. This is a fairly bleak stretch of road – a good opportunity to find shapes in the clouds or otherwise feast on the sky. The farms on this stretch have become large and therefore the farmyards are quite a distance from each other. You are driving on the bottom of what was Lake Agassiz thousands of years ago. Geographers refer to this area as the First Prairie Level because it is the lowest agricultural area on the Prairies. You’ll notice there are few native grassed or wooded areas and no wetlands. Farmers have been encouraged to drain the wet areas. Consequently you will not see many animals, domestic or wild, along this stretch. At Sanford you’ll come across a welcome distraction from the bare prairie, the La Salle River. This stream gathers water from as far as Portage la Prairie and deposits it into the Red River just south of Wpg. You might notice how the smaller towns differ in character. Some, like Sanford and Sperling a little farther along, just happen to be beside the highway. We don’t have to slow down for them and so we see little of them unless we deliberately turn in. Others like Brunkild require us to slow down and invite us to stop or at least check out what the place has to offer. Semi truck drivers and some commuters don’t like this inconvenience. They lobby the government to build bypasses around these small centres. Those of us who depend on services in our nearest small town, counter-lobby to keep the roads as they are, so as to attract visitors and cash. You’ll go past Homewood where my mother’s family (The Klassens) grew up on a farm. Of the 15 children and 100 (or so) grand and great grandchildren born as a result of that union only 3 families are still farming in the area. Carman has been built up in the woodlands along the Boyne River. At the stop sign turn left to stay on the main tour route. You’re now traveling south through farmland that sports a few more trees and farmsteads. There is a large U-pick farm on the left along here. Carry on crossing a few eastbound streams until you come to a stop sign. Winkler is a side trip on your left and Morden is on the main route on your right. These are sister towns; both prosperous and highly influenced by the Mennonites who settled here 80 to 100 years ago. Morden has a wonderful, small annual folk festival on the first Sunday in June. You’ll find us there. Coming out of Morden you’ll start your ascent out of the Lake Agassiz plain up onto the second prairie level. There is more mixed farming up here and so you’ll begin to see cattle, horses and more wild life especially around the lower, wetter areas. If you time it well, you can join the town of Manitou in its annual early September Maple Syrup and Garlic Festival – lots of great food and entertainment. The streams and ditches in this area take water south and west toward the Pembina River. Past Manitou you suddenly encounter the Pembina River by following a steep ravine down to the town of La Riviere. The good people of the area host a passion play in summer. In winter there’s a downhill ski resort – where I learned to ski as a kid. Back up on the prairie you’ll go past Pilot Mound and Crystal City. Keep a keen eye open for an intersection south of Crystal City. If you go straight you’ll end up at the US border. You can either turn right on #3A to go past the beautiful village of Clearwater (home to the Harvest Moon Festival in September) or go past the #3A until you get to the place where the # 3 Hwy turns right. You’ll go past a few small towns, around the left overs of a country gas station and around ‘Pancake’ Lake – as we called them when we were kids -and you’ll come to a dead end where you meet the # 18 Hwy going north to Killarney. Turn to Killarney and then turn west/left again when you get to Killarney’s outskirts. The # 3 along here is a cool road because you can see the Turtle Mountains (they’re mountains to us!) to the south and you’ll drive across and along a couple ravines that take water down from the hills to the Pembina river system. Ravines are a distinctive feature of this Highway. Most are fenced and provide native pasture and wildlife habitat. Keep your eyes open for beaver and muskrat huts, white tail deer and coyotes. 25 k’s west of Killarney you’ll come to the corner of #3 and #10. Go west toward Deloraine from this intersection. (About 5 k’s along you’ll go past what used to be our family farm – where I grew up – on the left/south of the road.) 6 k’s along you’ll see a sign for Lake Max. Turn south along the gravel road and move up into the treed parkland. 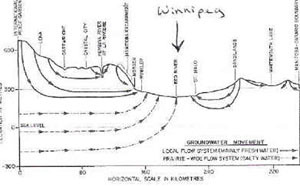 The snow or water you see in the creeks and wetlands eventually reaches Winnipeg via Cherry Creek, Pembina River and Red River. Just past the cultivated prairie (a bit more than 5 k’s from # 3 Hwy.) you’ll see our sign ‘Room To Grow’. Turn right. The Straw House is on your left when you’re on the yard.